The Johnny Seven toy line from Topper Toys was introduced in 1964 by – Topper was a subsidiary of Elizabeth, New Jersey-based toy manufacturer, Deluxe Reading. 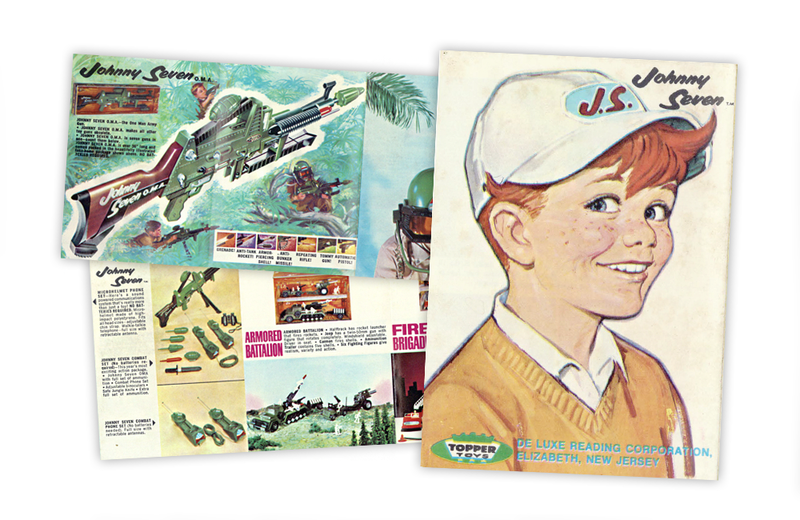 Marketed exclusively to boys, the series consisted of playsets and realistic facsimiles of military equipment. The crown jewel of the line was the Johnny Seven O.M.A. (One Man Army) toy gun, touted as “seven guns in one.” Depending on their playtime mission, kids could assemble and disassemble the toy into a Tommy gun, grenade launcher, anti-tank rocket launcher, armour-piercing shell launcher, tripod-mounted rifle, repeating rifle, and an automatic pistol. Thanks heavy television marketing, the Johnny Seven O.M.A. became one of the best-selling boy’s toys in its first year. Topper doubled-down on the toy gun’s popularity with the release of additional Johnny Seven military equipment, including the Microhelmet Phone Set, a plastic helmet with tinted visor, adjustable chin strap, walkie-talkie telephone, and retractable antenna – as well as a Combat Phone Set that included two walkie-talkie phones connected by 30-feet or wire. Johnny Seven playsets came fully assembled and packaged in brightly-coloured, illustrated boxes with eye-catching graphics designed to appeal to children. The offerings included an Armored Battalion, Fire Brigade, Service Station, and a sport car-based Speed Set. For a more detailed look at the entire Johnny Seven line, checkout this advertising booklet from 1964. Nicolas Ricketts, Curator at the National Museum of Play at The Strong, takes a look at Clue, a beloved classic game and 2017 inductee into the National Toy Hall of Fame.